← Wow What a Debut! 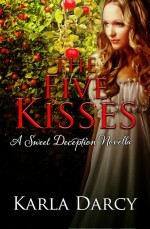 It’s been mentioned at Almack’s and even at White’s that THE FIVE KISSES was the first book in the Sweet Regency Romance series. That’s all well and good as on dits go but just who is this bounder, Jonathon Sweet, and what does he have to do with these books. Much as my lips should be sealed, but seldom are, I could give you a hint. 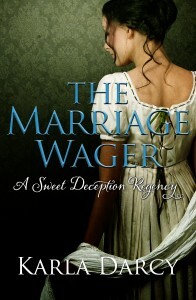 The whole story of THE MARRIAGE WAGER begins with Jonathan Sweet. If it wasn’t for Jonathan Sweet, Jena Christie and her nanny would not have been kidnapped by a bunch of drunken noblemen on her way home from her job as a seamstress at a London theater. How good is your imagination? Send me your best guess as to who Jonathan Sweet is. Make your guess on the comment form at the bottom of the post and I’ll choose the most ingenious entry and send you a gift of THE MARRIAGE WAGER. You’ll love this comedy of manners. Just like in the movie The Princess Bride this book has everything: there’s fencing, fighting, torture, revenge, giants, monsters, chases, escapes, true love, miracles… Well OK so there’s not giants but there could have been. And maybe no monsters but there’s no point in quibbling over small points. In any case, you’ll be laughing and crying and loving the chase at the end. In two weeks you’ll have a chance to hear the whole story.